Even though we live right near the edge of the city in a barely-urban residential neighborhood, there’s still enough traffic on our street that I’d never be comfortable with having any of our cats running completely loose outdoors. While Annie doesn’t appear to have any desire to either go outside or interact with the dogs, Oliver always seems very disappointed when the dogs go out in the yard without him. He’d watch them through the window, or if we accidentally left the kitchen door open, he’d stand up on his hind legs and try to watch them through the storm door. At first, an enclosed cat playground seemed like a great idea, despite the stratospheric prices. I still think that, especially in the larger configurations, it would be a safe place for Oliver to have fun outside. Or at least, it would be fun until Axel decided to mark the playground and the kitty inside. 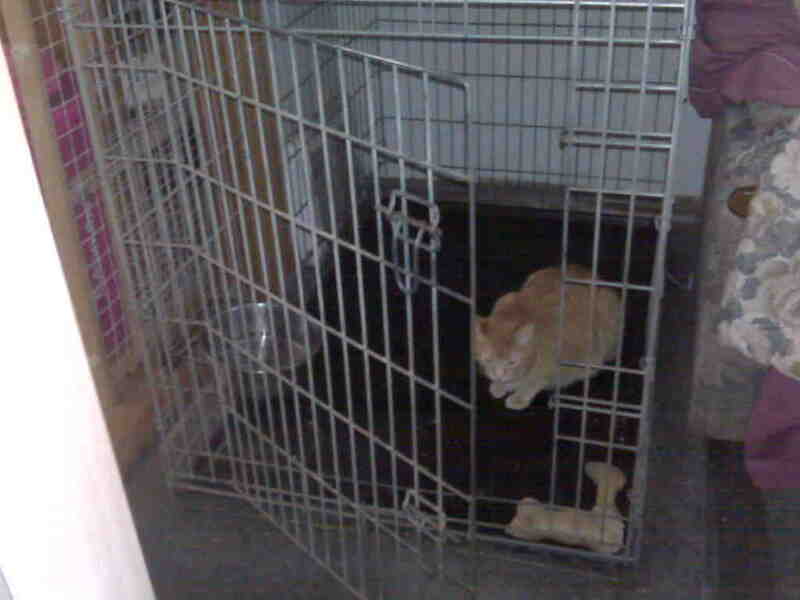 High price is one thing I might be able to get past, but giving the dog the opportunity to pee on the captive cat? Deal breaker! So it’s back to the cheaper and probably more logical plan of a harness and leash. Notice I didn’t say easier. An attempt to harness-train Oliver as a kitten didn’t go particularly well, even though I suspect we just gave up too quickly. For this attempt, I bought a Coastal Size Right harness in the largest size available (12″-18″) and a 6′ lead for a total of about $8. This time, it didn’t go too badly. Oliver’s attempts to bite me were half-hearted and didn’t even draw blood. He did try to wriggle out of the harness at first, but he gave up much more quickly than I expected. 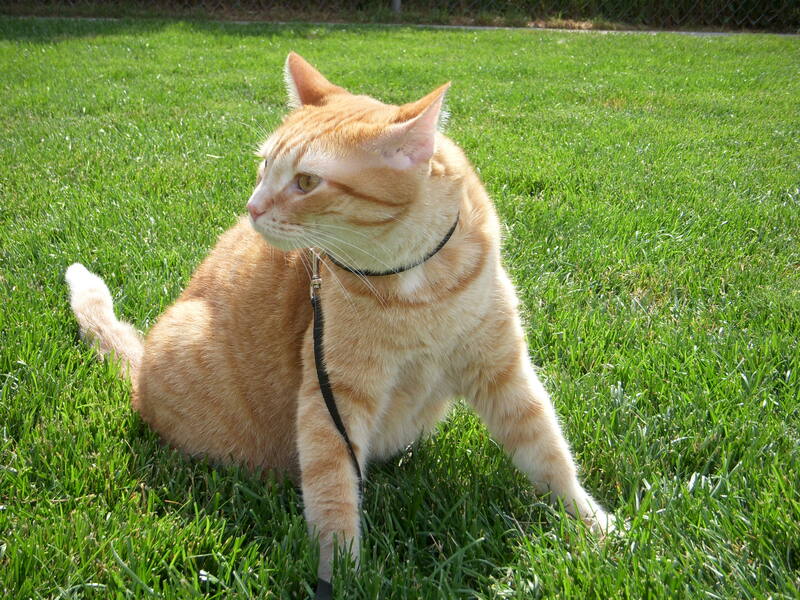 Like most cats, he doesn’t really walk on leash. He mostly just sits or stands there and moves only when an approaching dog or dog toy requires him to do so. He was a bit overwhelmed at first, but now that we’re a few days into it, he does seem to enjoy being out in the fresh air and sunshine with his Rottweiler siblings. Time for the third edition of the Saturday Pet Blogger Blog Hop, co-hosted by Life With Dogs, Two Little Cavaliers, and Nip and Bones! Today, meet our kittyweiler Oliver. Oliver is 4 years old. 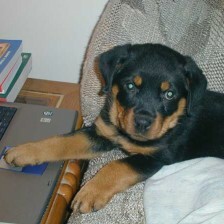 He was raised by a Rottweiler, and helped to raise another one. That’s why he is the kittyweiler. He may be tougher than the actual resident Rottweilers. He was rescued as a very young kitten, found in a power plant in Valparaiso, Indiana. Like Freya, his main job was to help bring the sunshine back into our lives after the loss of a very special Rottweiler boy, and he proved himself more than up to the task, even at the young age of just 8 weeks. I never thought I’d have a more doggy cat than Random. Random was a large gray tabby cat that I owned from the time he was about 3 months old until we finally lost him to the effects of chronic renal failure at age 16. He was very affectionate, would come when you called his name, and he’d have actual conversations with me every morning while I was getting ready for work. 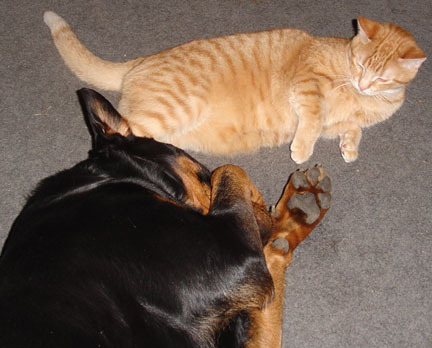 He was a very doggy cat, especially compared to our more typically aloof girl cats. Oliver has far surpassed Random’s dogginess and taken it to an art form. I’m sure it was because he was raised by a Rottweiler. I sometimes catch him eating food out of the dogs’ bowls, occasionally at the same time as a dog. He wrestles with the Rottweilers as if the size difference doesn’t matter. Here he is, trying out a Rottweiler-sized crate and believing it to be just right. Oliver is also fascinated with money. Well, who isn’t, really. But again, he takes it to an art form. When Dan was counting up the proceeds from a club event, Oliver sat nearby, and you would swear he was counting the money right along with Dan. Oliver would not leave until the task was complete. Right now, Oliver is helping me write this post. He’s pressed hard against my left arm, making it a bit difficult to type, but he’s determined to help me get this done and complete yet another NaBloPoMo day in March! Axel show update: nothing for today, and nothing for his pal Jules. Hoping for better days tomorrow and Sunday; please think good thoughts for the team!